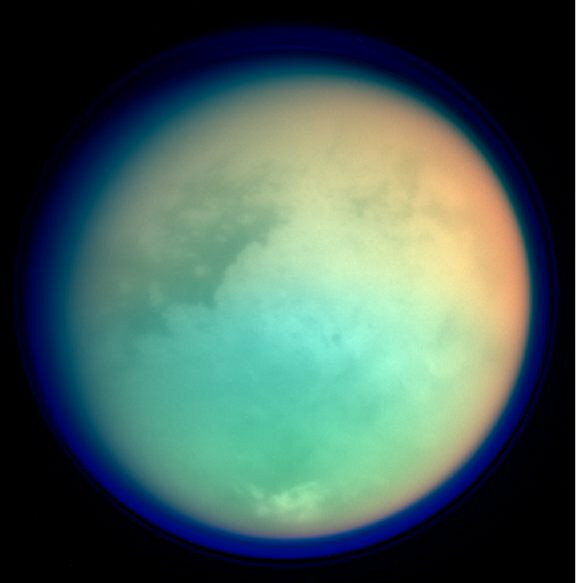 Does Titan's hydrocarbon soup hold a recipe for life? NASA researchers have confirmed the existence in Titan's atmosphere of vinyl cyanide, which is an organic compound that could potentially provide the cellular membranes for microbial life to form in Titan's vast methane oceans. If true, it could prove to us that life can flourish without the ubiquitous H2O. Earth-based cell membranes are made of phospholipids: molecular chains with phosphorus-oxygen heads and carbon-chain tails that bind to each other to form a flexible membrane in water. Methane-based life, should it exist, would need an alternative to Earth's phospholipid-based existence and would open up a much wider range of planets and moons to the possibility of extraterrestrial life. one possible alternative is vinyl cyanide. The Cassini spacecraft first inferred the presence of vinyl cyanide on the Saturnian moon through the use of its mass spectrometer, but it took the highly sensitive gaze of the Atacama Large Millimeter/submillimeter Array (ALMA), in the desert of Chile, to confirm vinyl cyanide is, indeed, there. Maureen Palmer, a researcher at NASA's Goddard Space Flight Center in Greenbelt, Maryland, and lead author of a paper describing the research in Science Advances, collected archival data from ALMA and saw vinyl cyanide high in Titan's atmosphere, at altitudes greater than 200 kilometers, with its highest concentrations in areas above Titan's southern pole. 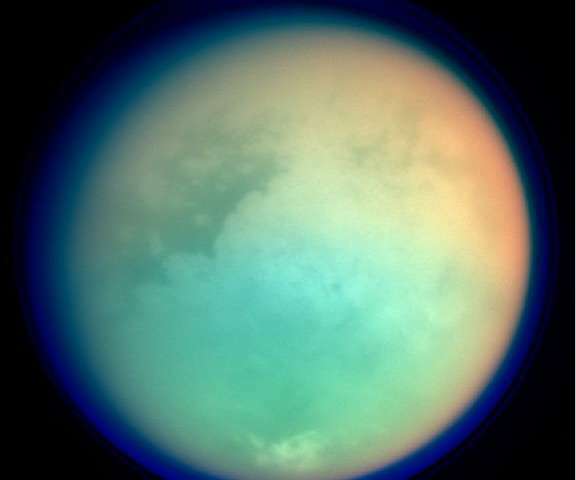 In the low temperatures on Titan, which reach –179 degrees Celsius (-290 degrees Fahrenheit), organic molecules in the atmosphere form droplets that rain down to fill methane lakes in a weather cycle similar to that of Earth's water cycle. There, they could potentially create simple, microscopic life forms. 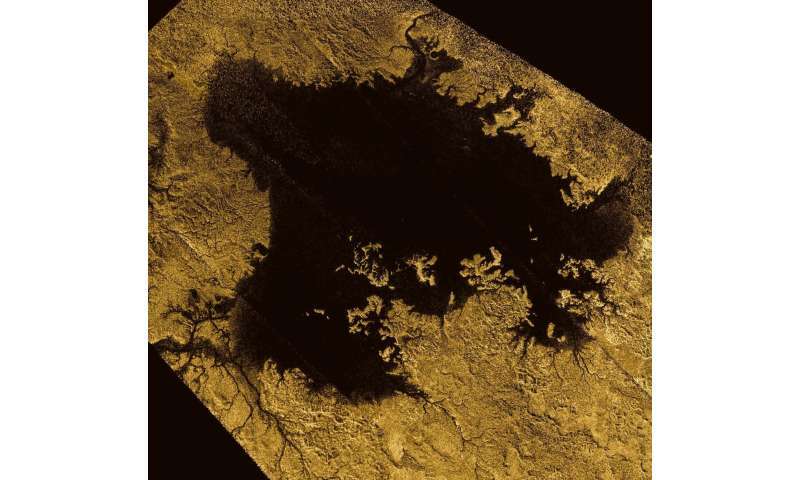 Palmer's group performed modeling studies that showed there is enough vinyl cyanide in Ligeia Mare, Titan's northern lake, to form about 10 million cells per cubic centimeter, roughly 10 times more than the bacteria in Earth's coastal oceans. Vinyl cyanide has yet to be proven to produce life, but an earlier study by Cornell University researchers that was also published in Science Advances made it an intriguing prospect. The Cornell researchers, led by Professor of Chemical and Biological Engineering Paulette Clancy, set out to discover whether molecules that exist on Titan could form cell membranes called azotosomes, which is the name given to cell membranes that might form in Titan's liquid methane conditions. Phosphorus and oxygen, found in Earth cell membranes, don't exist in Titan's frigid methane oceans, so any cell-like membranes would have to be based on nitrogen, hydrogen and carbon, all of which are abundant on Titan. Molecular modeling studies of a variety of molecules containing these elements showed that vinyl cyanide was the molecule most likely to form a stable and flexible membrane that acts like Earth-based membranes under Titan's conditions. Still, vinyl cyanide-based life, like any other, would face challenging circumstances on Titan. 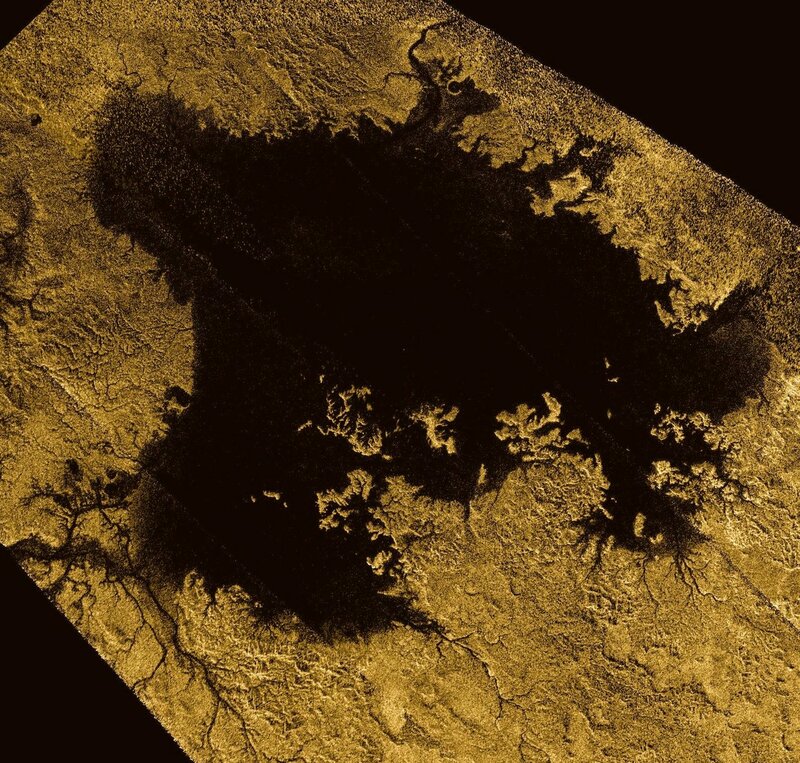 However, Palmer says that "if membranes can be made in a lab with a simulation of Titan's ocean conditions, it would make us more optimistic about them really forming on Titan." She notes further that because of its extensive atmospheric chemistry, and its bodies of surface liquid, Titan is "an interesting chemical laboratory to study the boundaries of possible biochemistry for creating life." Clancy says that Palmer's lab findings were "an exciting validation of our prediction, since they also find that the concentration of vinyl cyanide is considerable enough to make self-assembly into azotosome-like vesicles a viable process." She adds, "It also shows the power of molecular simulation to shine a flashlight onto the most promising candidates for prebiotic life in conditions that are difficult to emulate in the lab." This story is republished courtesy of NASA's Astrobiology Magazine. Explore the Earth and beyond at www.astrobio.net .